Australian swag company Jungle Reef Outdoors have swags with every swag feature you could ever imagine and Jungle Reef is a division of Global National Group of companies who have been in business since 1984 and it’s the same company that supplies the Australian Defence force so you know your swags will be a product that will endure all you can throw at it. Camping hiking or on a Road Trip, Jungle reef is known for its Australian Camping and Gear. These Australian Designed Jungle Reef Swags are available in four sizes Kids swags, Single swags, Large swags (King Single) and Double swags. These popular Jungle Reef Swags are designed with unique features and pretty much use the most heavy duty materials available including large tooth high quality 10 coil zips, heavy duty 15 oz. rip stop water proof canvas. Our new range of Khaki and Camoflague heavy duty 15oz rip stop water proof canvas swags are fitted with the legendary heavy duty YKK zips. Making these the toughest and only swags in Australia with 15oz canvas and YKK zips. Aussie swags companies like Jungle reef specialise in heavy duty innovative lifestyle swags which are designed with both top and front entry. The Innovative Foot Window on these swags allow great ventilation around the Feet and Even Better helps Cross Ventilation. 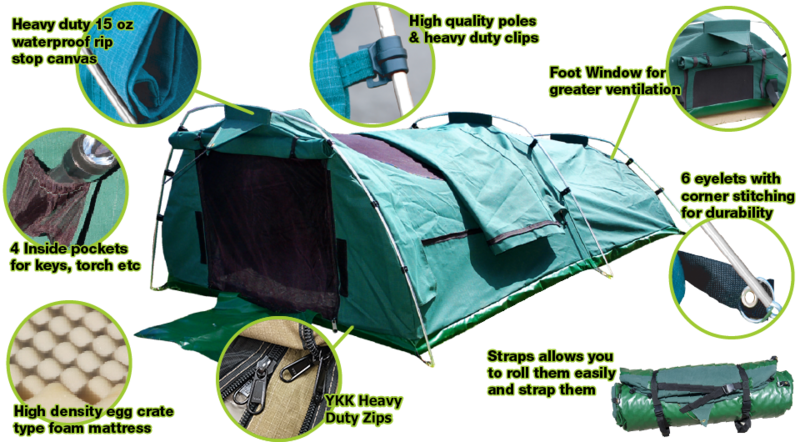 These High Quality Swags are designed with Sand Fly proof Mesh which is a unique and important feature for outback camping. These Swags Come with Comfortable Egg Crate Type Foam Mattress with a removable and washable cover. The PVC base comes in handy while camping on wet grounds or a rainy day. These swags are designed with 3 Heavy duty poles which fold up easily and fit into a pocket on the base of the swag. These high tension poles allow the swags to be stretched out easily and set up takes less than 3 minutes. The Swag also comes with 4 pockets which allows you to store your keys, torch , phones . The Swag comes with 8 pegs and 2 guy ropes allowing you to stretch the swag out so you can sleep comfortably. These swags are designed such that you don’t require to purchase a swag bag because the straps allows you to roll them easily and strap them so you don’t have to struggle to put your wet or soiled swag inside a bag. Having a traditional outdoor sleeping experience has never been so comfortable or affordable than with our Jungle Reef brand Swags. Made from heavy duty canvas with inner pockets for your sleep time essentials we are bringing you a little slice of Australiana at a fraction of the cost. Our new range of Khaki and Camoflague heavy duty 15oz rip stop water proof canvas swags are fitted with the legendary heavy duty YKK zips. Making these the toughest and only swags in Australia with 15oz canvas and YKK zips.